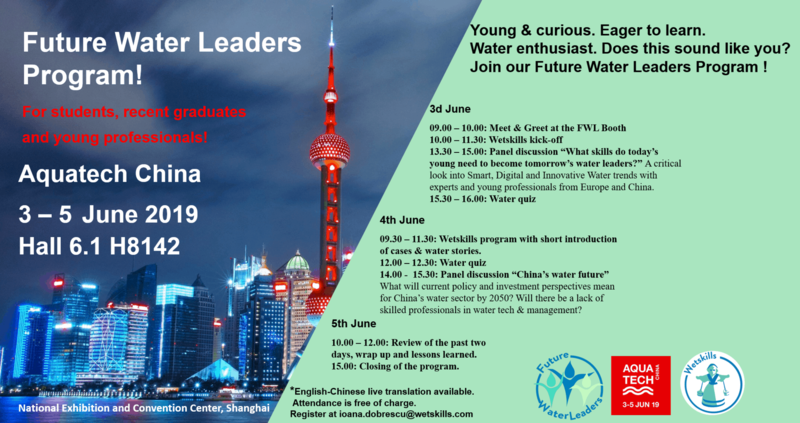 Wetskills is happy to announce it will organize a Future Water Leaders program in Shanghai in collaboration with Aquatech China (3-5 June). The Future Water Leaders program is addressing the development of the next generation of water professionals who will become leaders in the water sector. The program aims to attract recent graduates and young professionals in a series of activities designed specially to help expand their knowledge and network in the Chinese and international water sectors. The program will focus on interactive engagement with young professionals, where participants and visitors will get a chance to learn, contribute insights and ask questions to industry experts and fellow peers. Different projects, themes and innovations will be introduced through panel discussions and quizzes. The discussions will focus on linking sector trends with skill development among young people while the quizes will touch upon topics such as Plastic pollution, Fashion Footprint and Conscious Consumption. There will also be plenty of time allocated to guided interactions and spontaneous networking, as the Future Water Leaders booth will be the meet-up spot for young professionals. At the same time, the kick off of the third edition of Wetskills China will take place. Wetskills participants and case owners will be taking part in the Future Water Leaders activities of the first two days (3-4 June) and will be ready to mingle and network. There will be live English-Chinese translation available during the program, thus fear not the language barrier. Anyone who is interested in sharing knowledge, contacts and help shape the Future Leaders in Water is welcome to join us at the booth (6.1 H 8142) for a part of the program or the whole 3 days! If you are interested or would like to know more, contact Ioana Dobrescu (ioana.dobrescu@wetskills.com).